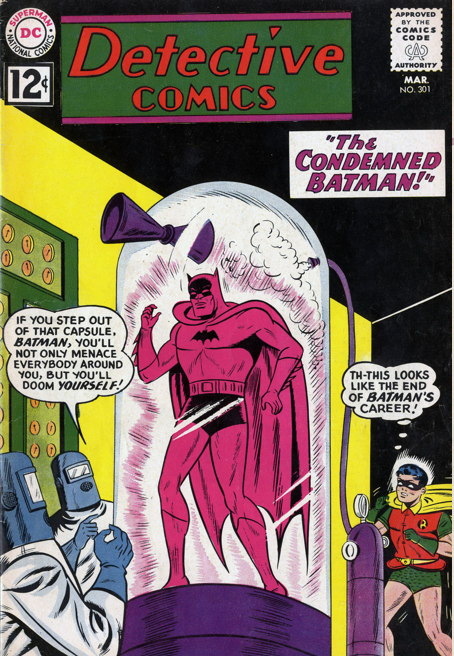 Another Batman story that I am including solely because of the back-up tale, this Sheldon Moldoff piece from Detective 301 (March 1962) sees Batman sealed in a plastic jar. 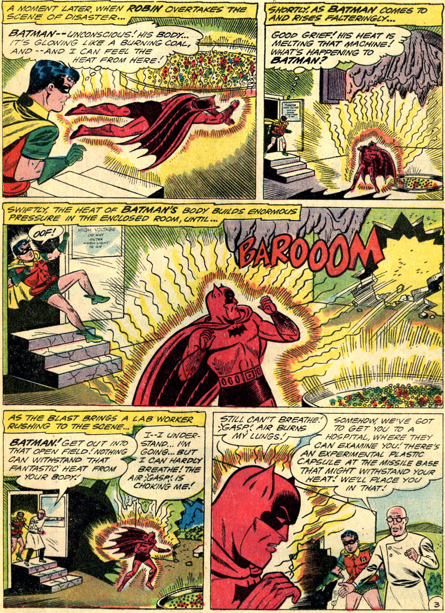 An accident at a factory making synthritc gems leaves Batman vibrantly coloured, and incapable of surviving in out air. 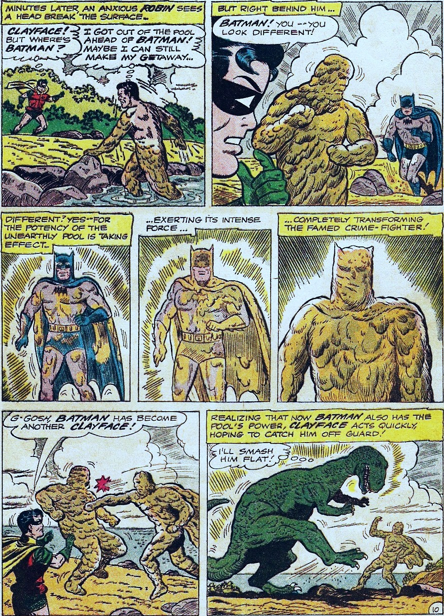 He also emits deadly heat and radiation. 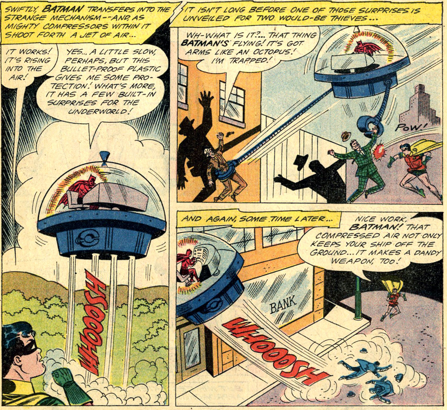 He starts fighting crime from a bubble craft with robotic arms, which is kind of fun for a few pages. 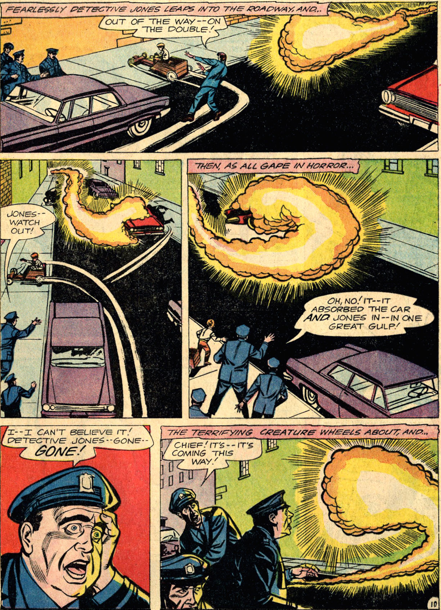 Eventually,in pursuit of some criminals, he winds up fried by a power line, which simply drains the deadly energy from him. 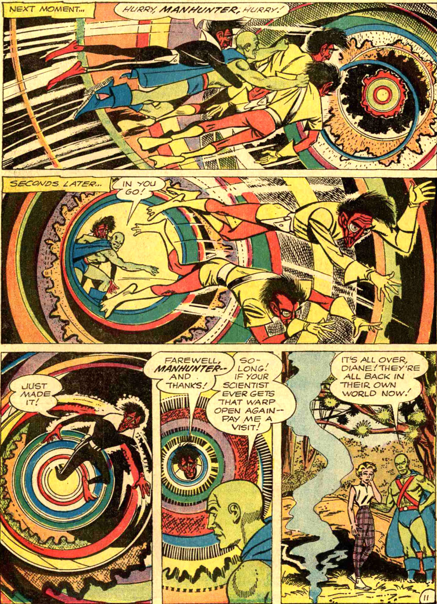 And the colour. 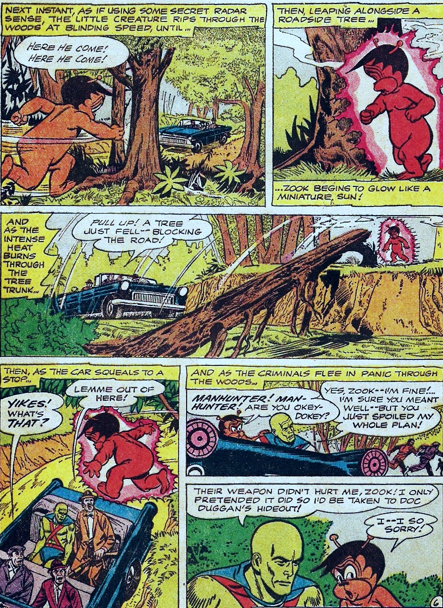 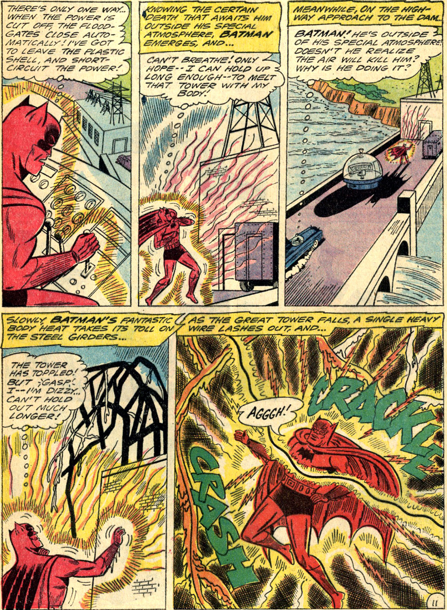 Although the colour fades more slowly than the power, allowing a final scene where the villains think he is still a danger to them, and give up. 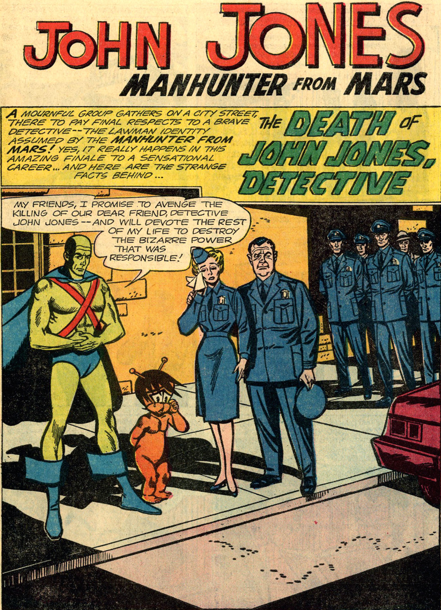 J’onn returns to Mars in this story. 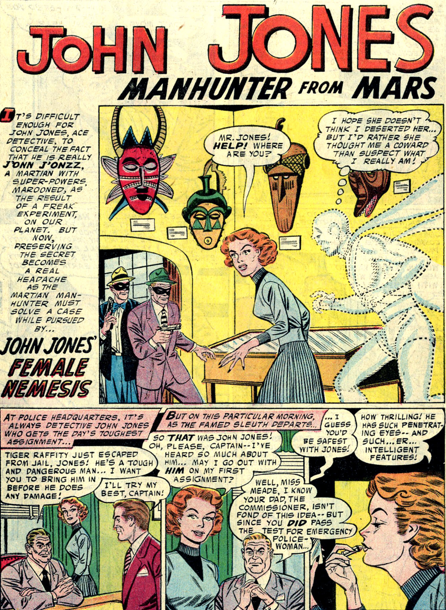 A band of Martians attack Earth,stealing radium, and John is unable to change and go after them because Diane Meade is there. 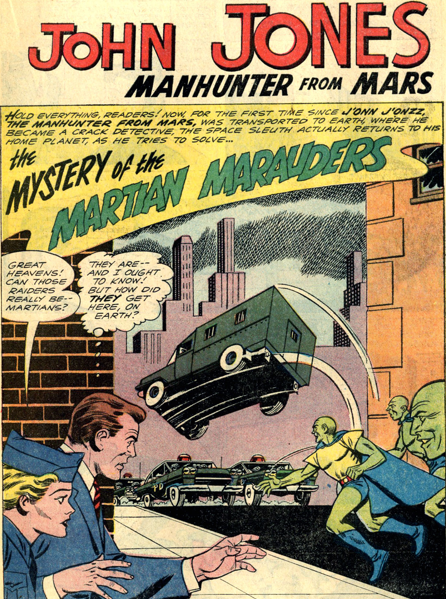 A scientist goes missing, and John tracks him, and the Martians, and realizes that the scientist has managed to rebuild Erdel’s teleportation machine. 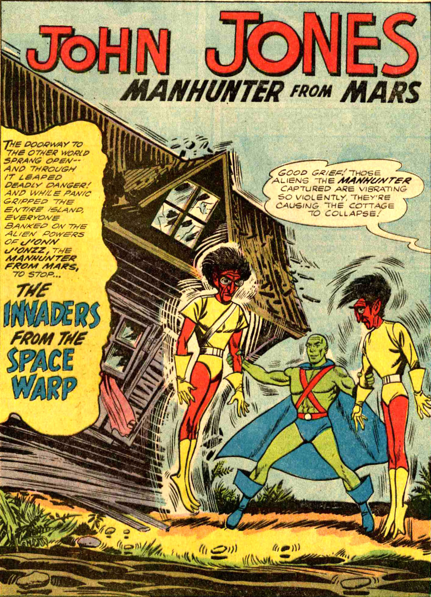 J’onn follows them to Mars, and is re-united with his parents and little brother. 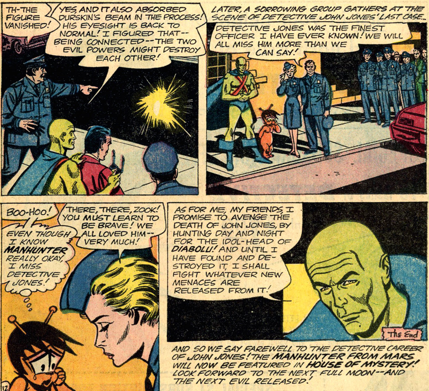 He has little time for reunions, though, as he winds up tracking the rogue Martians and renegade scientist, defeating them. 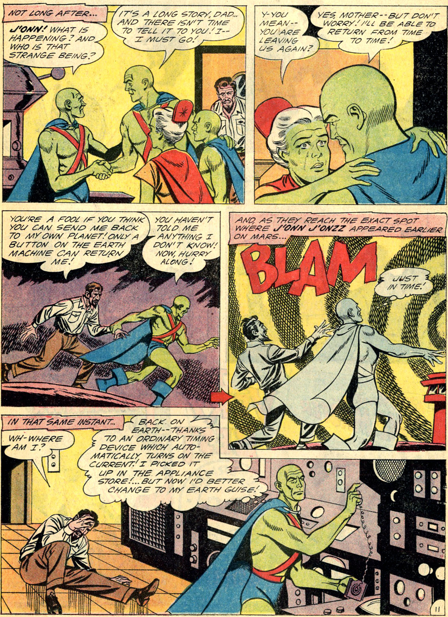 The scientist gets injured during the fight, and winds up with no memory of his time on Mars. 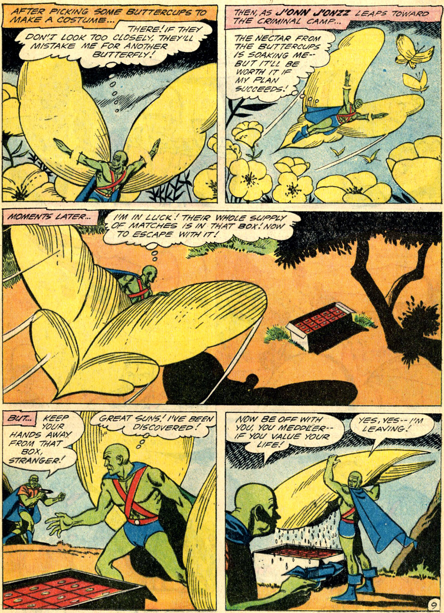 J’onn bids his parents and brother farewell, and returns to Earth. 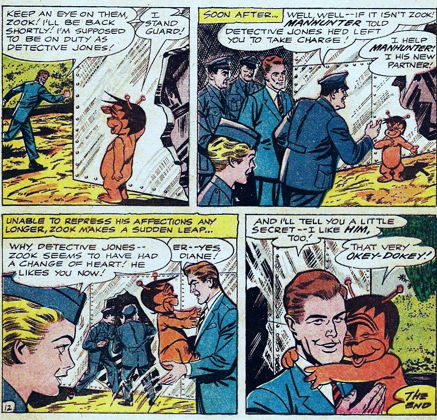 Why he wants to return isn’t explained beyond bringing back the scientist, but I would theorize he grew to enjoy the time away from his family. 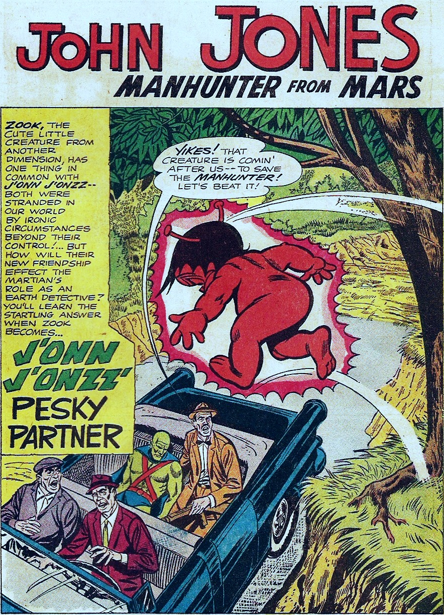 We saw no other connections of his on Mars aside from them. 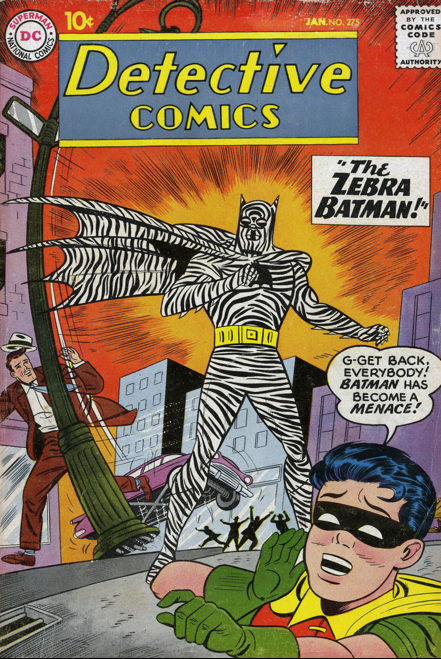 An eye-bending cover for Detective 275 (Jan. 60), and a memorably bizarre villain, Zebra Man, in this story by Bill Finger and Sheldon Moldoff. 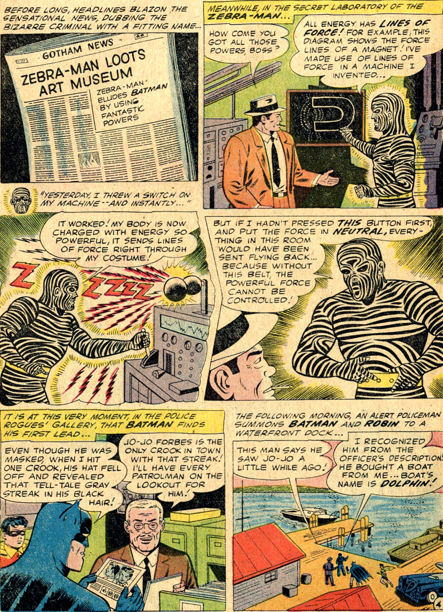 Zebra Man has invented a machine that powers his body with line of magnetic energy, and uses this to stave off Batman while committing crimes. 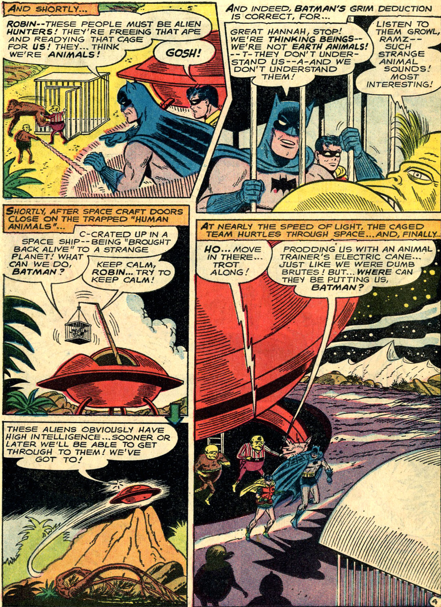 Batman finds his hide-out, and gets charged up by the machine as well. 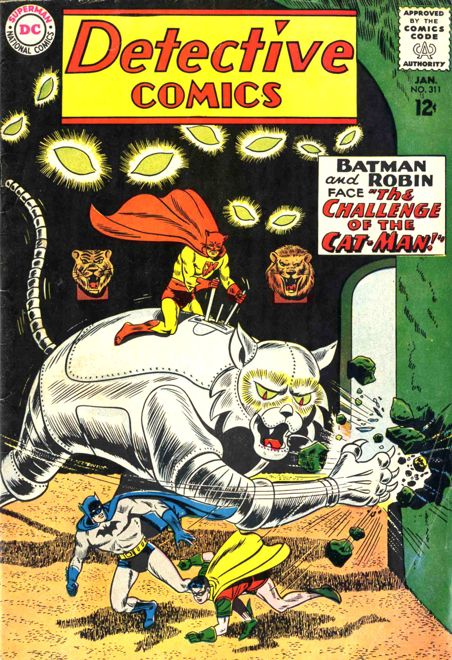 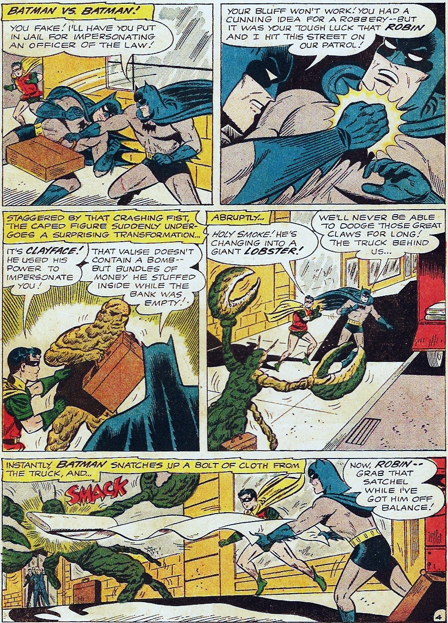 They are now equally matched, but Batman lacks the control belt the other uses, and cannot defeat him. 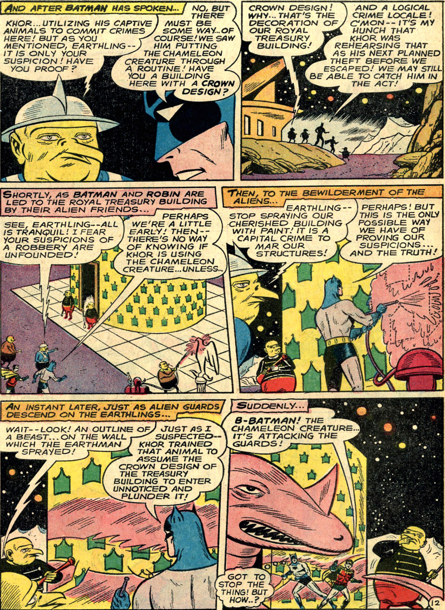 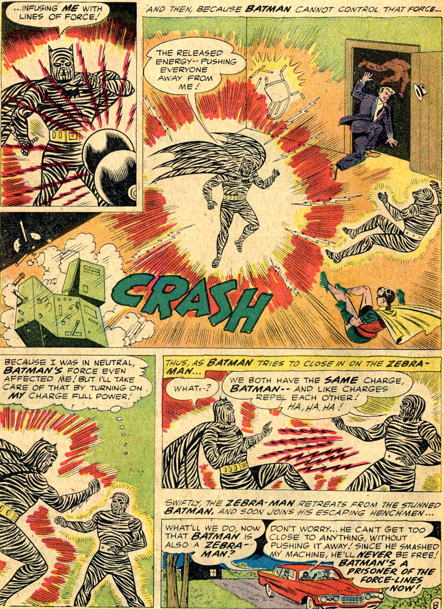 Finally, he lays a trap for Zebra Man, in a place Batman had already given a negative magnetic charge, which cancels out Zebra Man’s powers. 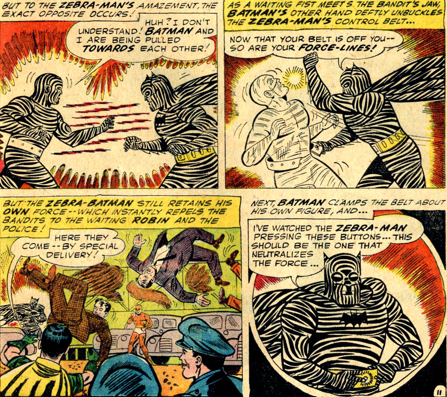 Although he does not appear again, Zebra Man is one of four Batman villains from this time who get recreated by Kobra in the 80s, part of Strikeforce Kobra that he sends after Batman and the Outsiders. 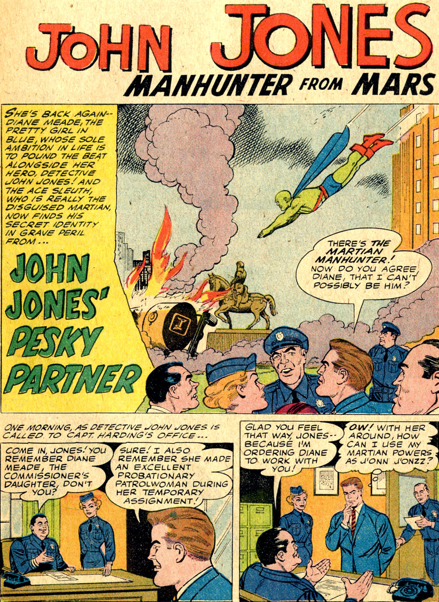 Diane Meade returns in this story, becoming John Jones’ partner. 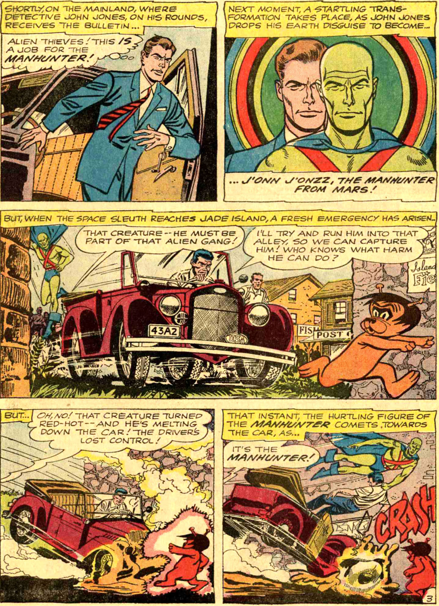 Now that J’onn is openly a hero, he takes on the secret identity problems that provide soooo many stories their plots. 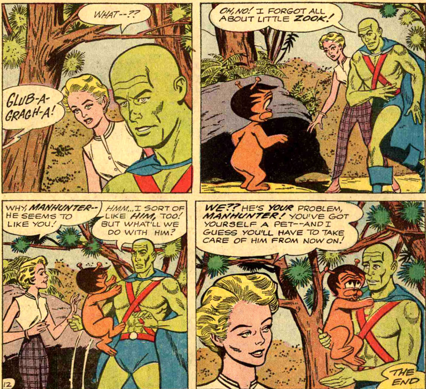 And Diane is thrust into the Lois Lane mould of always questioning John about being the Martian Manhunter. 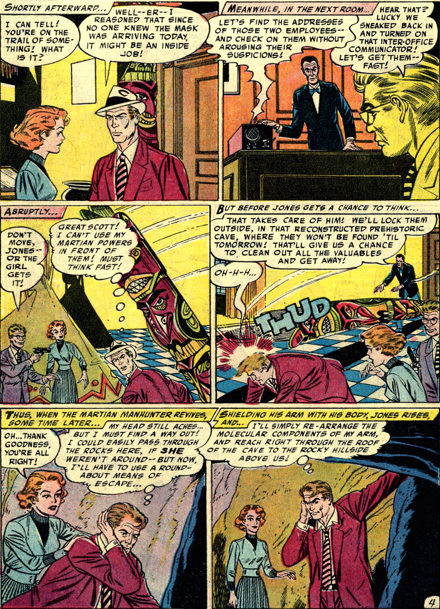 And though he disproves her suspicions in this story, they rise again in later ones. 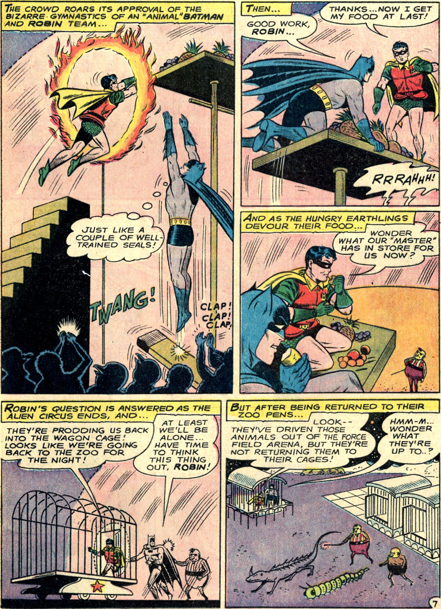 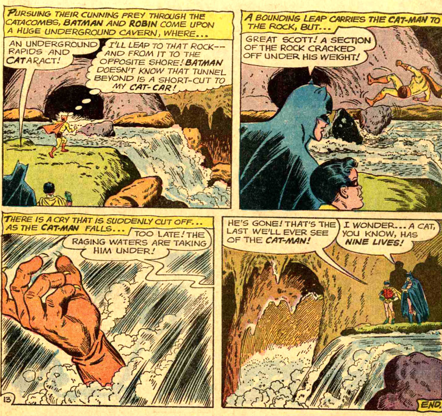 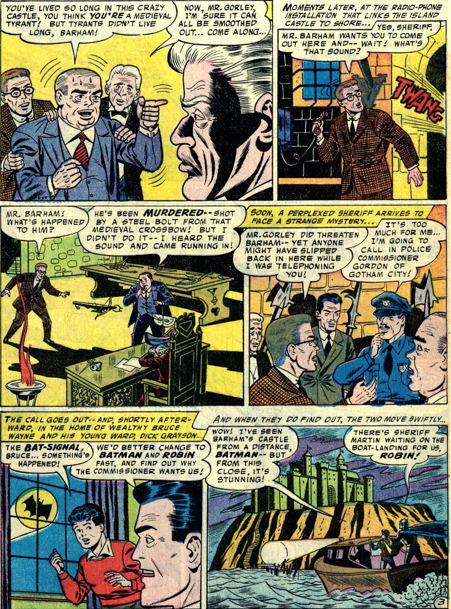 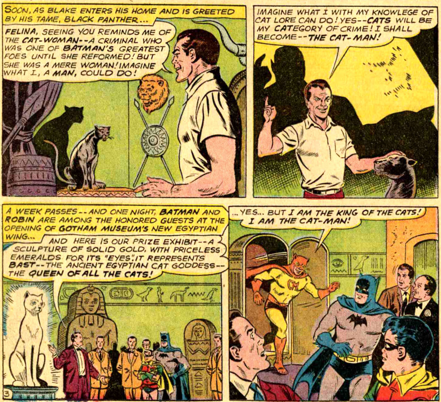 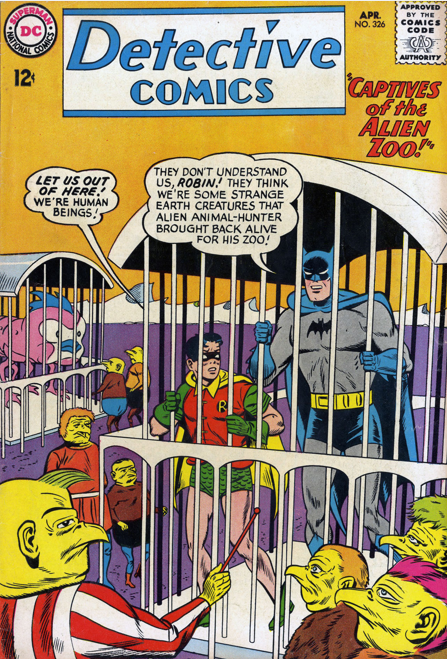 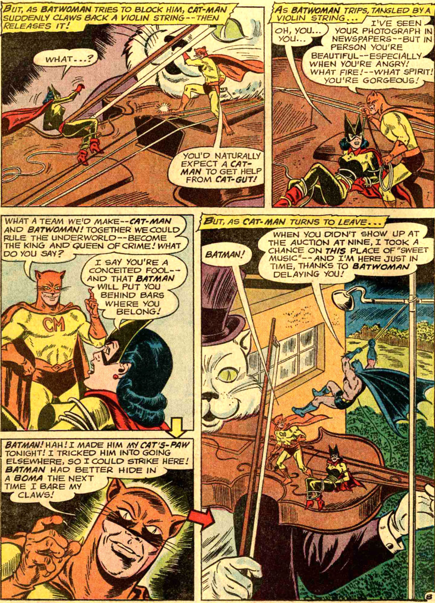 After years of increasingly silly tales, in Detective 246 (Aug. 57) Bill Finger and Sheldon Moldoff put Batman and Robin into a serious murder mystery, set in a castle just outside Gotham. 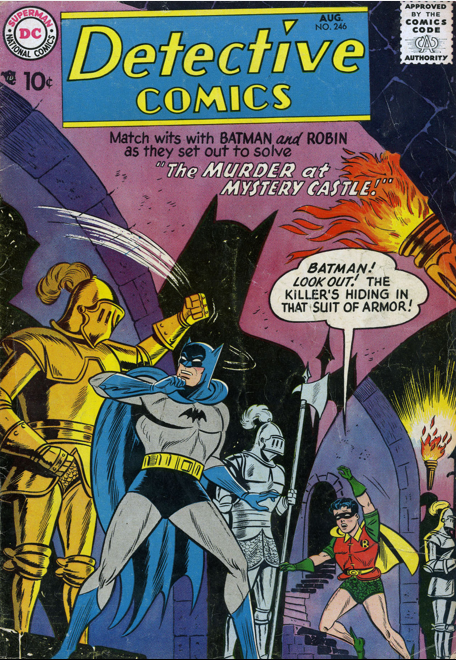 Wealthy gun dealer James Barham is murdered in his castle, and the four guests are the only possible suspects – relatives and business associates who all have reasons to kill him. 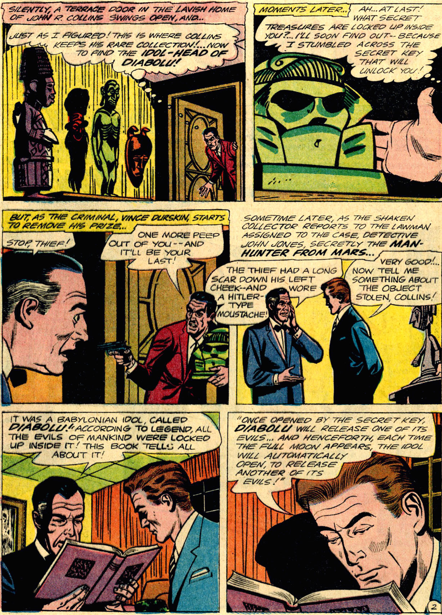 Part of the mystery is figuring out even how the murder was committed. 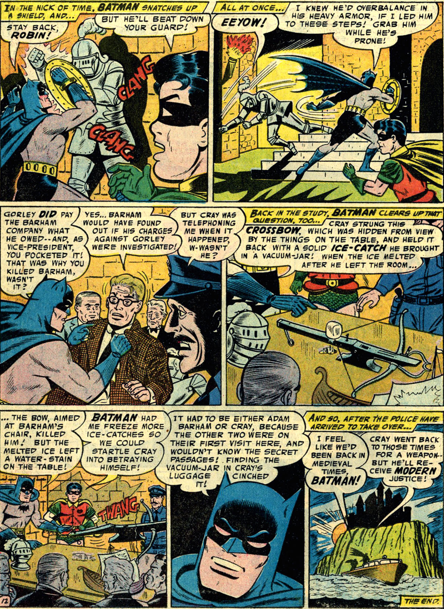 A crossbow was used as the weapon, but no one was in the room when it was fired. 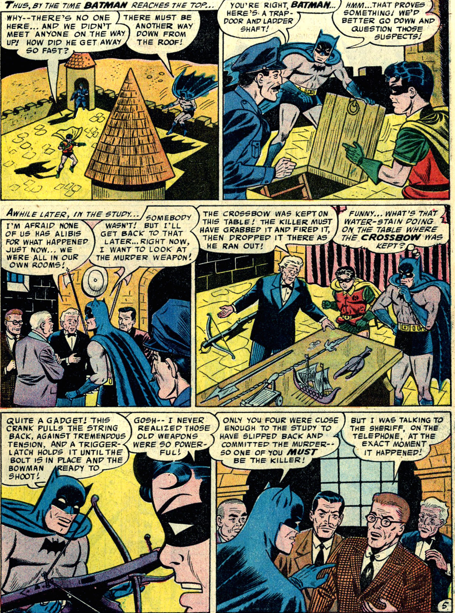 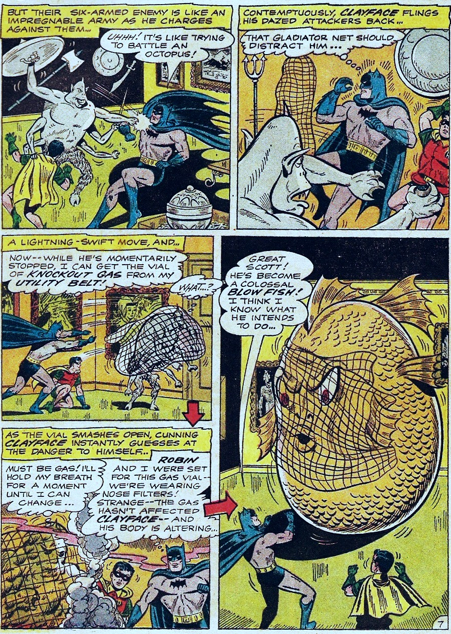 Batman puts the pieces together, and realizes the importance of the water stain on the table with the crossbow – a lump of ice was used to set it off. 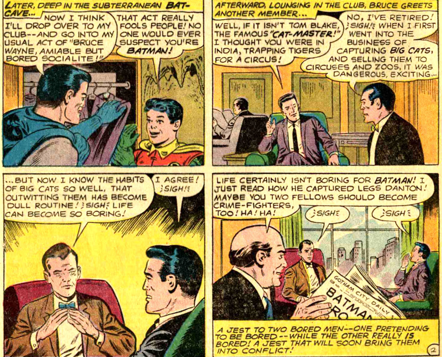 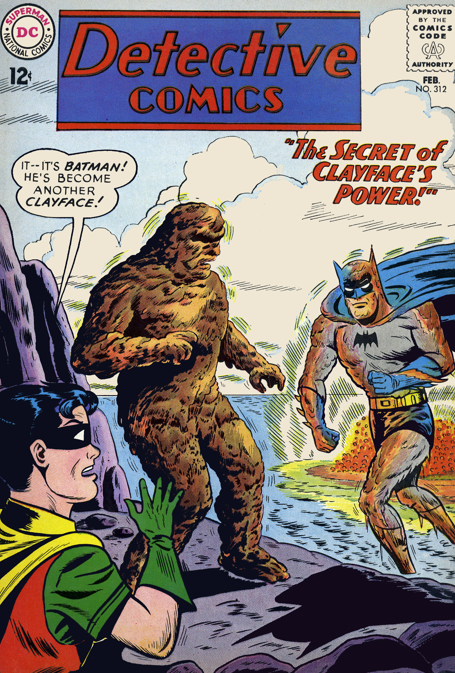 This is not the greatest Batman story ever told, not even close, but it’s still miles above most of what has been printed in the preceding few years. 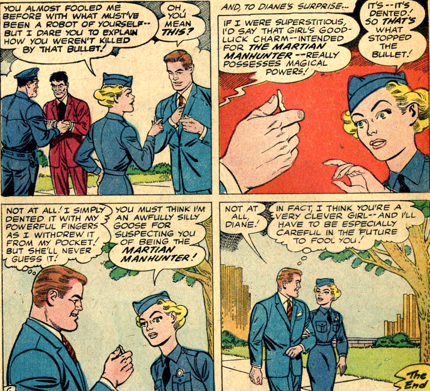 John Jones gets a female partner in this Jack Miller story, Diane Meade, a rookie policewoman. 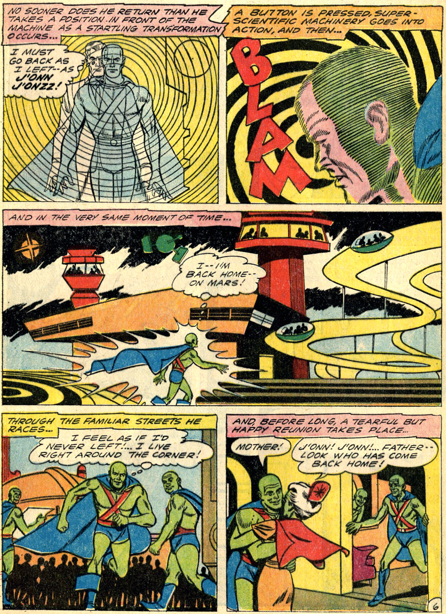 Her primary function in the story is to make life difficult for J’onn, who is not able to use his many powers on the case, simply because she is there and would see what he was doing. 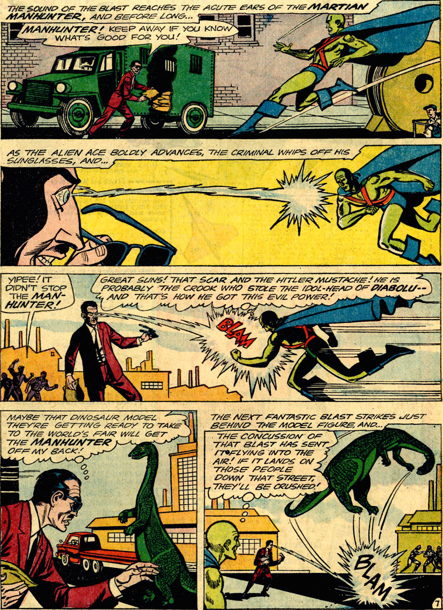 Much better than having a comet take away his powers for a story. 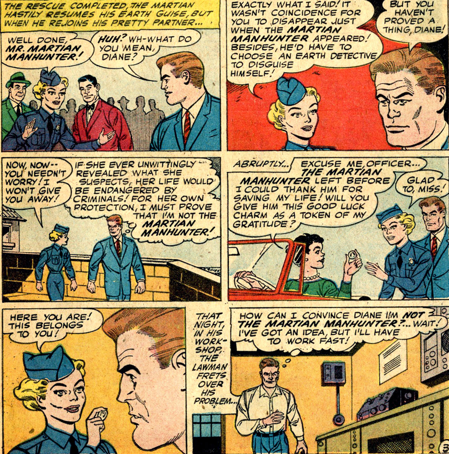 Diane was likely intended as a one-shot character, but her usefulness, as well as the lack of supporting cast in this strip, were probably responsible for her return a couple years down the road.